Natural rubber derives from a rubber tree's sap; synthetic rubber is a man-made material. 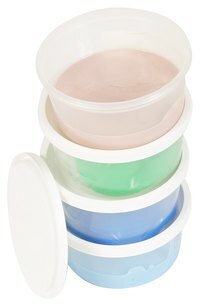 You can make your own rubber at home using cornstarch and silicone, which can be dyed and molded into any shape you desire. Once you make the homemade rubber, you can shape it by hand or put it into a mold. Homemade rubber can be crafted into a variety of useful objects, from coasters for a coffee table to beads for a necklace. Mix equal parts of cornstarch and silicone caulk in a bowl. Stir the mixture with the handle of a wooden spoon. Add a few drops of oil-based paint to the silicone and cornstarch mixture. Keep adding paint and stirring until the color is as intense as you want it to be. Stir the mixture for another minute or two until it turns into a putty-like consistency. Now it is ready to be hand-shaped or put into a mold. Work quickly to shape the mixture since it hardens within five to 10 minutes. An easy craft project to make with homemade rubber is coasters. Just roll the mixture flat and then stamp out circles with a cookie cutter. Cure your homemade rubber creation for several hours so that the rubber completely sets and hardens. Curing time depends on the size and shape of the object you make, but a minimum of two hours is required for small objects. Mix your homemade rubber in a well-ventilated area. Silicone caulk gives off a very intense odor.